When I saw how pretty the new Under the Sea polishes from Barry M are, I really wanted to test them in some galaxy nail art, and it's been a while since I've done one, so here we are. I used a base of Barry M Black Forest with a coat of Diamond Glitter, then I sponged Cotton lightly across the nails. Once that was all dry I went in randomly sponging all 4 Under the Sea polishes. I did go in a bit heavy with them but the colours all came out beautifully. To finish it all off I did some dots of Cotton and painted a couple of larger stars on, I stamped a galaxy swirl from Maniology M001 then topped with a coat of Plumpy topcoat. 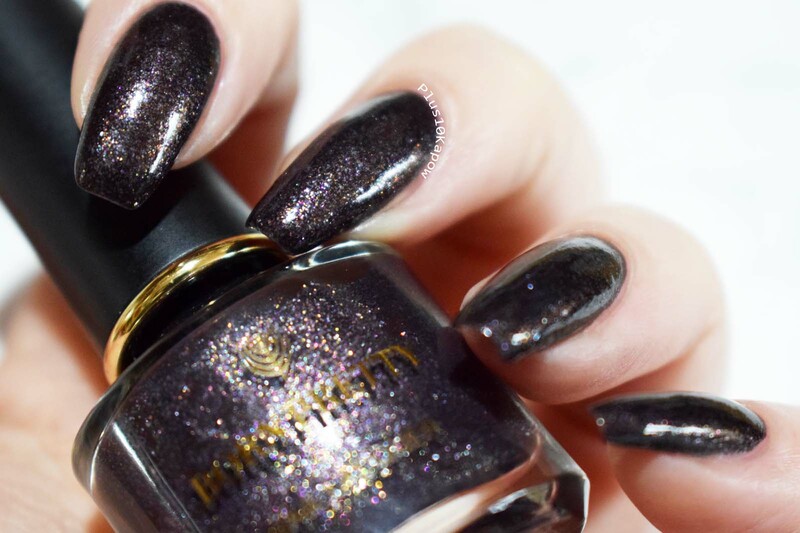 These polishes are now available on BarryM.com and from Superdrug online and in stores. 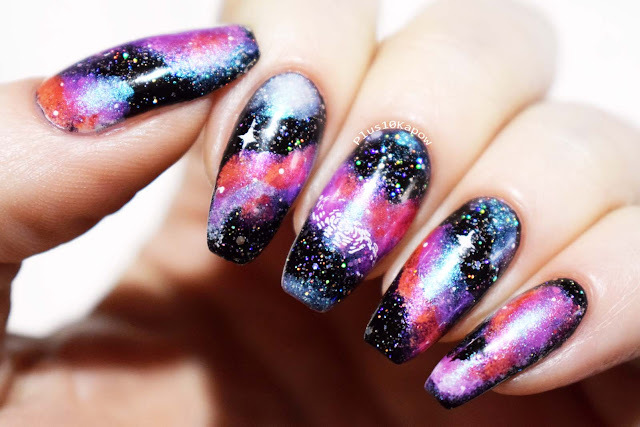 Don't you just love a good galaxy mani? Today I want to show you this flowery, layered stamping plate from Born Pretty Store. I got serious Little Mermaid vibes from the 4 new polishes released for the Under the Sea range from Barry M, so I had to do some Little Mermaid nail art for these beauties. 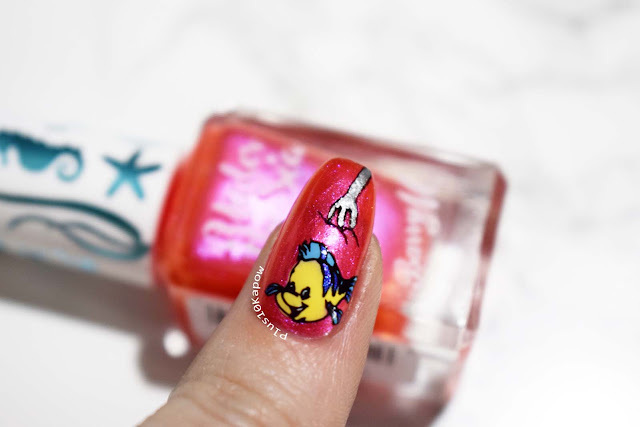 I used all 4 colours and incorporated them into this fun Ariel mani, with a little help from some other Barry M polishes. I even added Flounder and a dinglehopper! Although my dinglehopper has definitely seen better days. 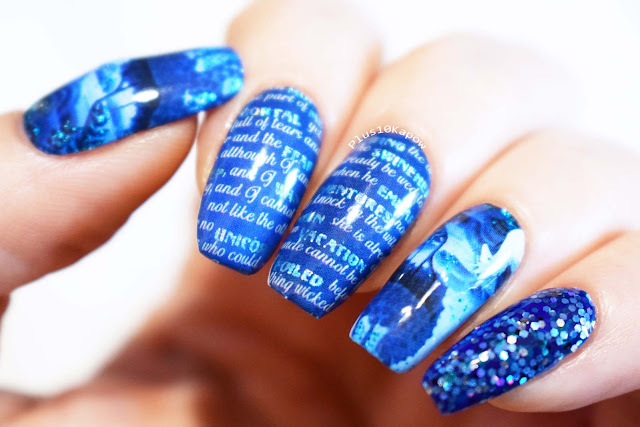 I am in love with this mani, so much that I am doing it on my friend's nails tomorrow night. It turned out so cute, if I do say so myself! 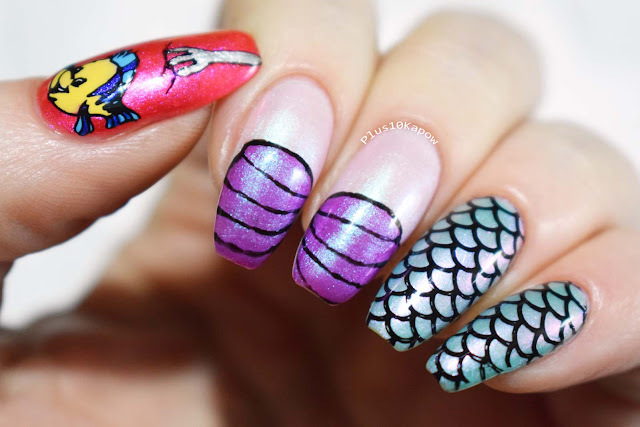 The new Under the Sea nail paints are currently available on BarryM.com and in Superdrug store from February 28th. There is nothing I would like more at the moment, than to be sipping a cup of tea, with some finger sandwiches, reading Vogon poetry, in a quiet corner of Milliways, the restaurant at the end of the universe! OK, so maybe not Vogon poetry, it's a bit tough to get through, 3rd worst in the universe didn't you know? 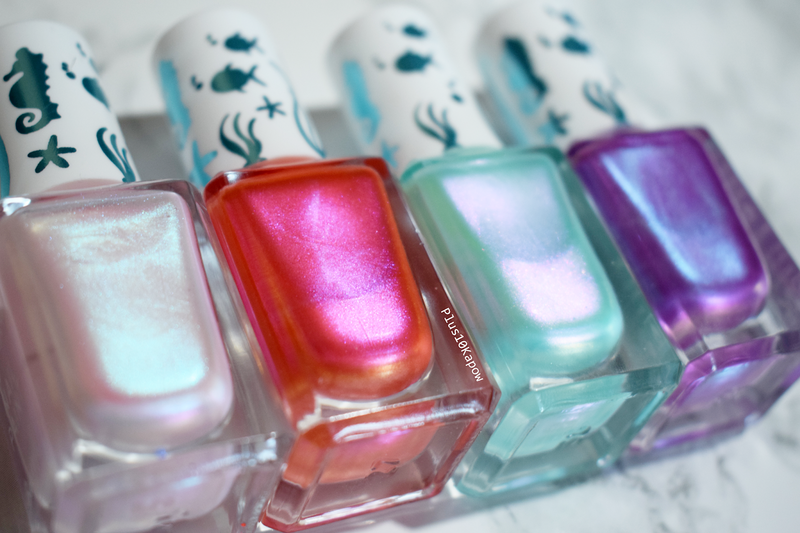 Barry M sent me over the 4 new, beautiful polishes for the Under the Sea range. 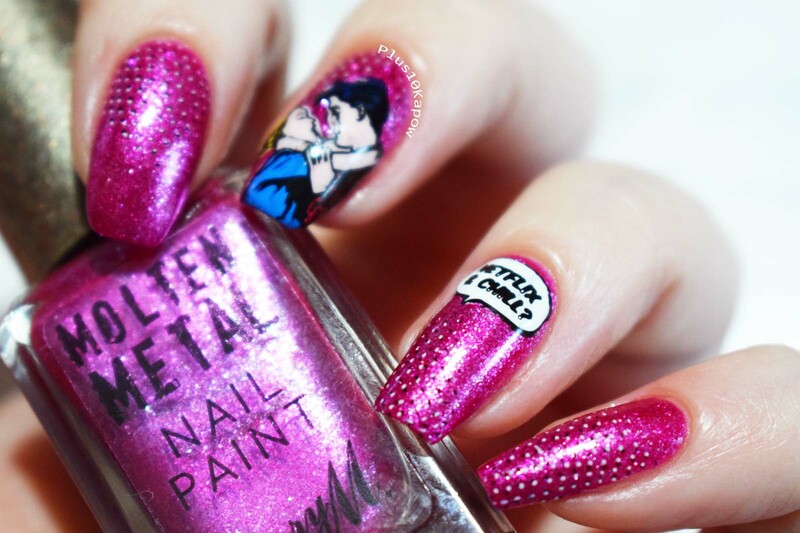 I actually don't have any of these polishes in my collection and I have no idea why! These 4 have made me want the whole range now. First of all, who else is getting Little Mermaid vibes from the colours? That's the first thing I thought of when I saw them. 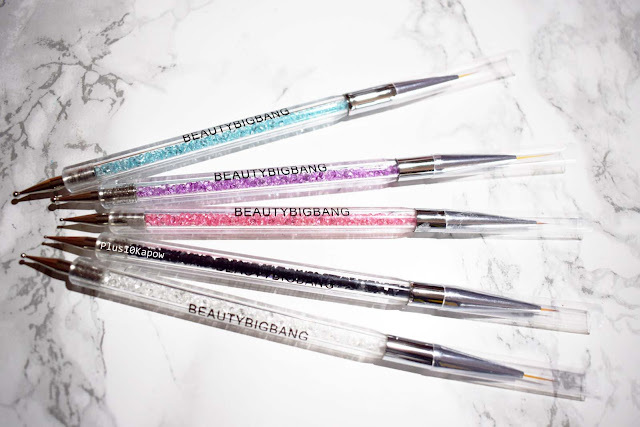 The 4 colours, from left to right are Oyster Beach, Coral Reef, Sea Turtle and Dragonfish. All of them are beautiful, peralescent and sheer polishes with a gorgeous shimmer. 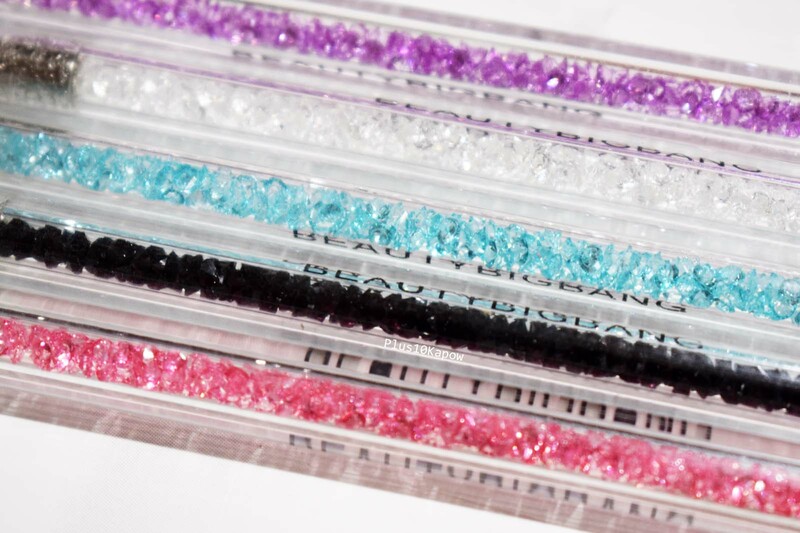 Lets get in to the swatches, shall we?! 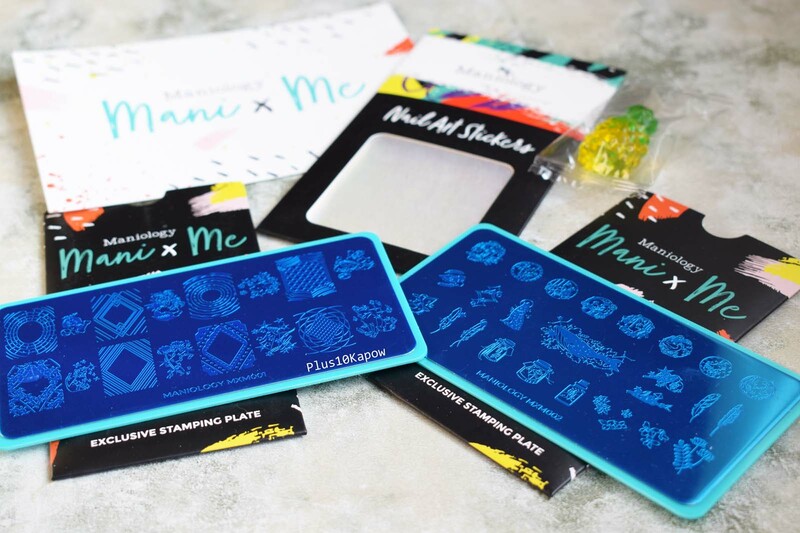 I am pretty late to the party with the Mani X Me kit for February, but you do have until midnight tomorrow (22nd) to order and receive this month's, so I thought I would knock out a post just to give you an idea of what's in it, although I am sure you have probably already seen nail art using these plates. Anyway, I bought the Express Kit, which came with 2 exclusive plates, some nail art stickers and a little pineapple jelly sweet, all in a cute, branded drawstring bag. I'm pretty sure you get the jelly sweet in every order now and although it was naughty to eat it, I did and it was delicious. 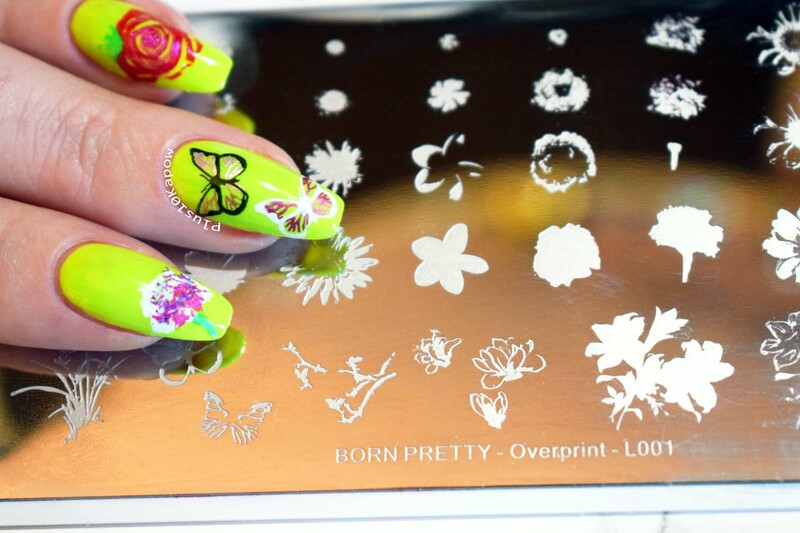 Today I have done a bit of nail art using the Born Pretty Store Chinese Style L003 stamping plate. I absolutely love this plate! It has images very similar to Chinese style art to build your own masterpiece and I have built a mani that, and not to toot my own horn, would make Bob Ross a little bit jealous! 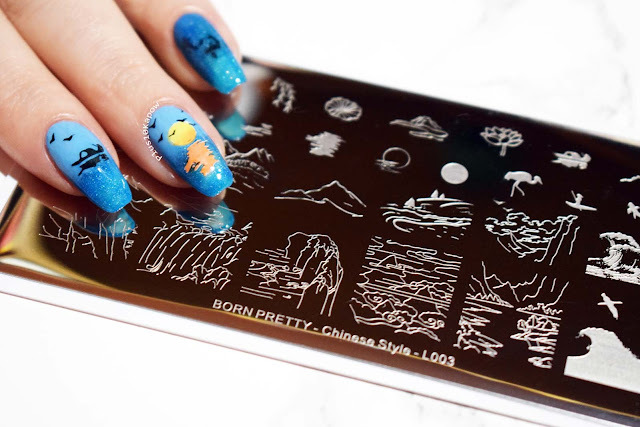 But you'll see the nail art in a minute, unless you scroll straight down of course. It feels like I spent forever trying to get a decent photo of this beautiful glitter but my camera was just having none of it today, too much going on in it I think. But you can sort of see how pretty it is, it just looks a little messy too! "Romance" glitter mix on Charlie's Nail Art and saw the awesome superhero water decals and knew that I wanted to combine the 2 together. 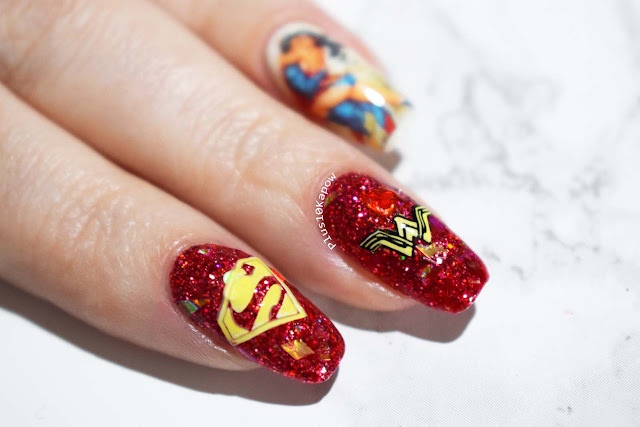 Superman and Wonder Woman's romantic dalliances are often very brief and tend to occur in alternate timelines or in their past, but they would make such a good couple and this water decal of them kissing is perfect for nerdy nail art at this time of year. You can find the Romance glitter mix here for 75p for a 4g bag, and you can find the Superman & Batman water decals here for 89p. 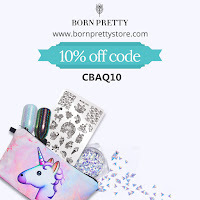 Don't forget to use code CLPK10 for 10% off your order. What are you up to for Valentine's Day? This week Supernatural hit their 300th episode! Which is pretty awesome considering how few shows these days actually reach this point, and they definitely worked hard for it, so massive congrats to them. Supernatural is an awesome tv show and one of my favourites, and now that I am (slowly) working through it from the beginning again with Kian and he absolutely loves it, it makes it even more special to me. I love that we get to bond over it and his favourite character is Dean. 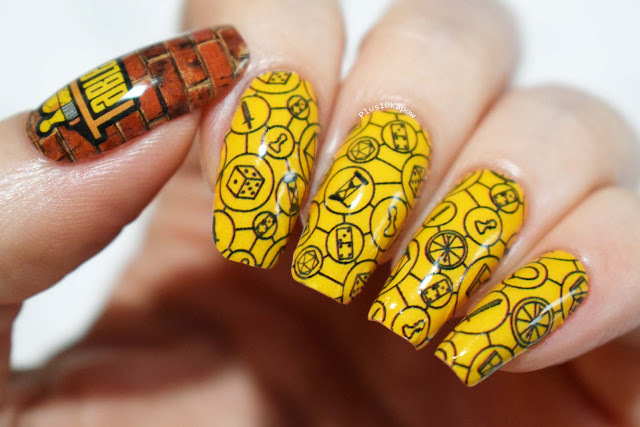 To celebrate the 300th episode I am finally wearing the amazing Seraph nail wraps from Espionage Cosmetics. 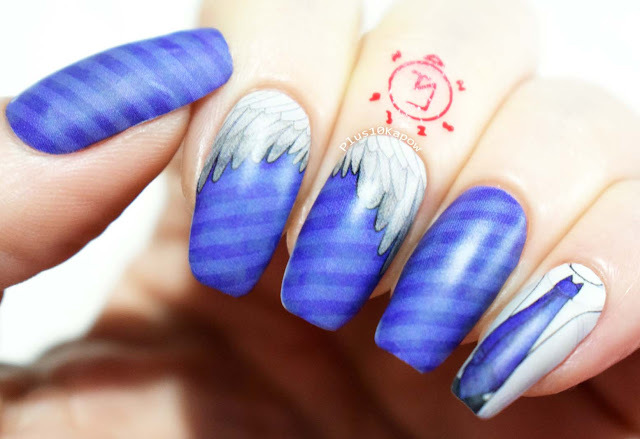 Inspired by everybody's favourite angel Castiel, these wraps are normally glossy but I added a coat of matte topcoat. I also added the angel banishing spell to my finger, stamped from Moyou Gothic 01 using Barry M Siren. 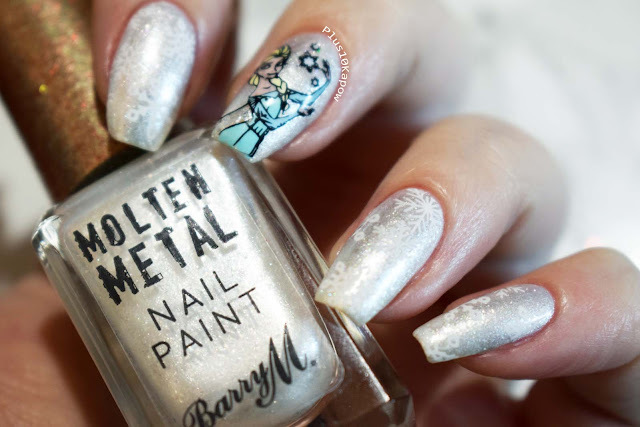 This is the last mani I have done using the the new Barry M Molten Metals. For this one I have used Golden Hour as the base and the bronze/golden shift made me think of the Egyptians, and my obvious segue was to Stargate. 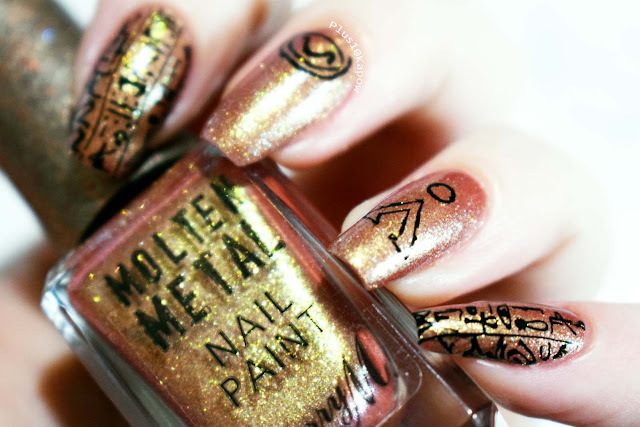 Now, I LOVED my original False Gods mani but I had wished that I had done some more Stargate specific nails. I had used the symbol for Ra but really wished I had done the symbol for Apophis. So this time I did! 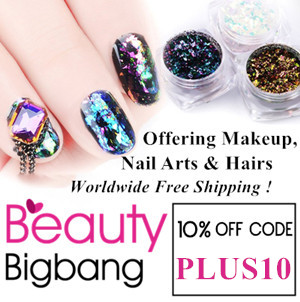 Have you heard of peel off nail polishes? It seems like loads of people are giving it a go now and I was really interested in finding out what these were like, which is why I chose this stunner from Born Pretty to review. So not only have I been suffering from lack of motivation these last few days, but today I am feeling particularly unwell and progressively so throughout the day. I suspect it's a migraine caused by the heating and the sunshine bouncing off the snow. Because of this, I have been rushing to get today's tasks done today and because of both this and my motivational issues, I am super glad that today is my Espionage Cosmetics nail wraps day. It took me ages to choose which set I wanted to use today, it's going to have to get to the point where I either close my eyes and choose or I number every set and each week just get a number generator to choose for me. 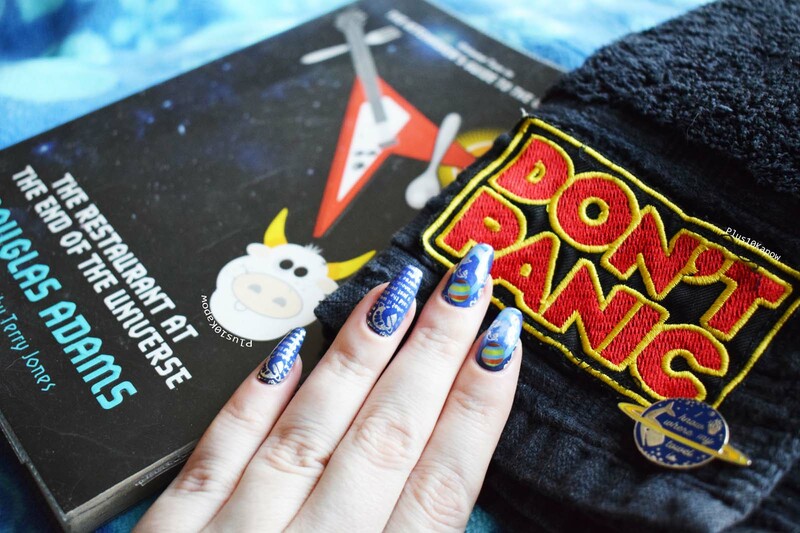 In the end, I chose the very beautiful, The Last Unicorn set and added a glittery accent on my pinkie from the Glitter Jedi approved Feisty Droid wrap set. The Last Unicorn is an animated, musical, fantasy film about a unicorn who learns that she is the last of her species and sets out on a mission to learn what happened to the rest of her kind. The films has voices of a plethora of familiar names. Definitely worth a watch if you haven't seen it before and definitely one of the few occasions I will say that the movie was better than the book. These beauties are fully licensed and are still available to buy along with 2 other sets that are in The Last Unicorn collection, pop over here to check them out. While you are there check out their featured sale, they've got wrap sets from as low as $4. 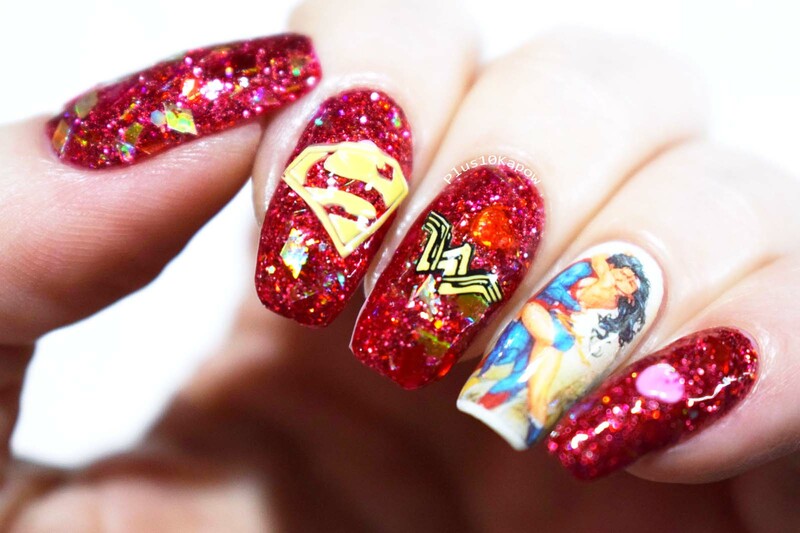 Don't forget that you can use code PLUS10KAPOW to save 15% off an order of $25 or more. 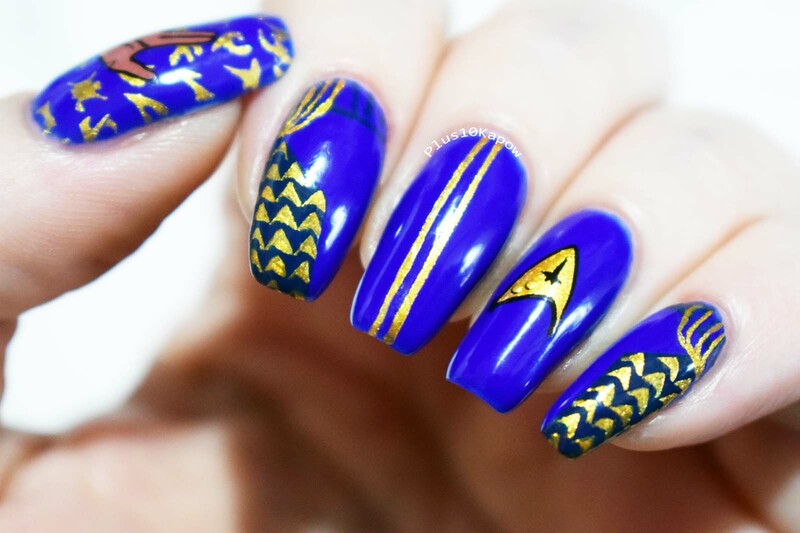 I know I have a load of stuff to be getting through, and that it is taking me ages to get through it all but for the last few days I have been severely lacking in the motivation department and yesterday, after a whole day of being lackadaisical with everything, I suddenly got the urge to do some Star Trek: Discovery nails. I currently have only watched season 1 because I am saving up season 2 episodes so I can binge them (Netflix has turned me into a monster) but I really enjoyed season 1 and Michael Burnham is pretty kickass.